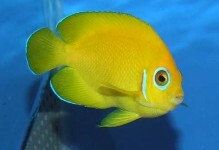 The French Angelfish is one of the more popular angelfish varieties. The face is a pale, dusky-blue with eyes rimmed in yellow and white. 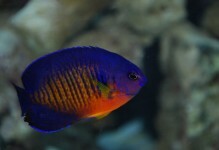 The body is a dark, dusky-blue with yellow scale margins giving the French Angelfish a dappled appearance. 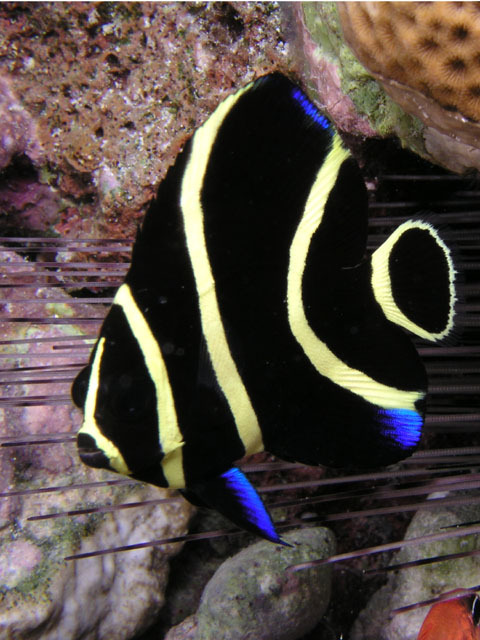 A yellow smudge highlights the pectoral fin while the gill cover has a yellow rim. A 250 gallon or larger tank should be provided and include large amounts of live rock for hiding and grazing. 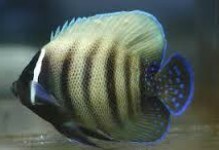 Not a good candidate for a reef tank, the French Angelfish has a tendency to nip at sessile invertebrates (soft and stony corals) and clam mantles, and also tends to dominate the tank. 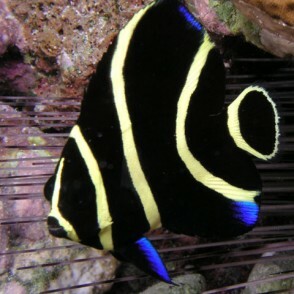 The diet of the French Angelfish should include Spirulina, marine algae, occasional high-quality angelfish preparations with added sponge matter, and mysis or frozen shrimp. It should be fed at least three times daily. 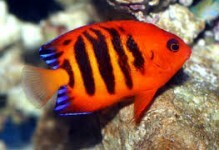 The Small Juvenile will contain the Juvenile colorations or may be color shifting to a young adult, while the Medium will be a sub-adult, and the Large will be in Adult coloration.